Coming up, on August 26, at 7 pm, is my next major Melbourne Concert, to be held at the Armadale Uniting Church. Please follow this link for tickets sales, Melbourne concert reviews and write ups on all past major Flamenco and Jazz Guitar concerts. The audience will be immersed in a flow of harmonious melodies that are delivered upon the precision of clockwork grooves. My objective is to share with you 40 years of experience, where I have used music to achieve my personal well being. I play, compose and perform to feel in sync with nature. I also make sure to stay in sync, by conscious self awareness of staying in the flow. Come along and experience the feel. I believe music is that art form that connects us to the real existence. It allows us to tap into nature, there fore allowing nature to feed back to us harmony and beauty. This occurs when the pure expression of sharing occurs. Does music make you feel rejuvenated ? When does music make you feel special? Can music make you wish to say I care for you ? I know it certainly does for me. Not only does it make me feel special, rejuvenated and full of love. It makes me want to share these special moments with all of you. I am frequently asked if the concert is related to the Uniting Church. Well, no. The concerts are held in a Church, not because of any religious implications, but because of its vast architecture and the consequent sound. 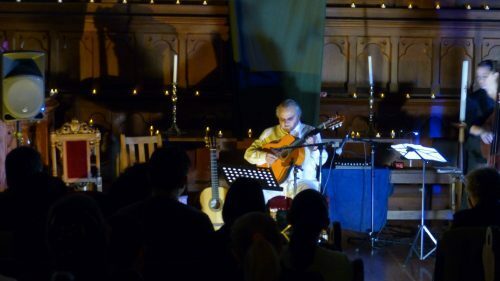 I love playing in warm Churches with dimmed lights, high ceilings and colours that reflect from the stained glass windows. It feels very cosy . This concerts is my most prized event that I offer through my music production services. I generally perform acoustic guitar music at my concerts. The styles are a consequence of what the composition needs to be understood and shared with you. Please join us at our upcoming Melbourne acoustic guitar music concerts. Be part of this exciting personal adventure into the beauty of life.